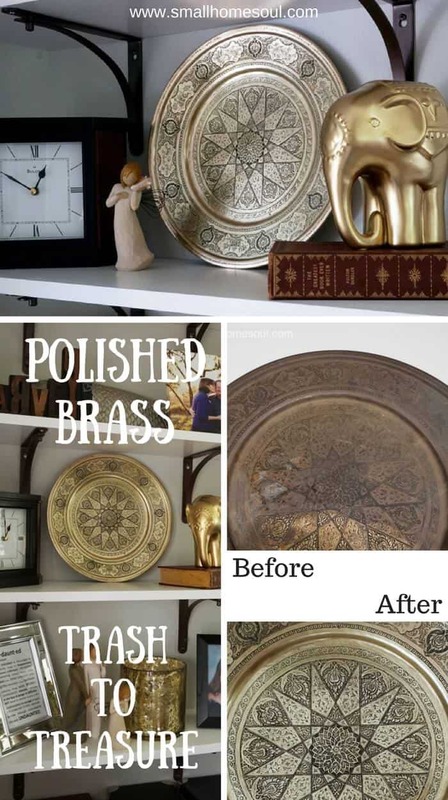 Polished Brass Platter - from Trash to Treasure - Girl, Just DIY! 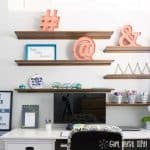 Creative DIY for your life and home. By Toni | Girl, Just DIY! Digging through my diy “stash” in the garage a few months ago I pulled an ugly looking platter out of the cabinet. It was gross and grungy. And honestly, I don’t even know where I got it. It might have been included with a bunch of stuff at a yard sale or thrift store. But seriously it was so gross I’m sure I wouldn’t have bought it on purpose. I decided to do a little work on it before I tossed it in the donation box. Turns out, there was pretty under the crud so today I’m going to show you how beautifully polished brass turns that trash into treasure. 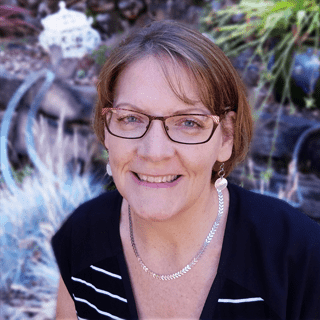 earn a small commission (at no extra cost to you). 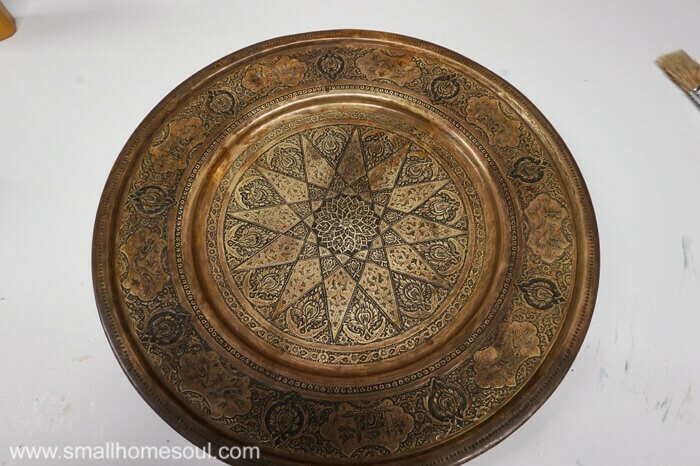 Normally I would search for the best way to polish brass with natural products but after reading the ingredient list online I feel comfortable using brasso. One note, because it contains ammonia do not use this in your house. If you’ve never polished brass before do so in the garage with the door cracked for ventilation. This picture does it too much justice, it looked a lot worse in person. You can see in the pic above where I gave it the tiny polish to see what was under all that crud. I followed the directions on the Brasso bottle and shook it up well. Instead of spreading it on the rag I opted instead to spread on a first coat with a chip brush. Almost immediately the creamy color brasso started turning blue. I let it sit for about 10 minutes and let it work before returning to wipe it off with the cloth. Here’s what it looked like after an easy wipe of the cloth. Much better but not perfect yet. I applied another light coat and let it sit for a few more minutes. After wiping that layer off I began really giving it some elbow grease and the beauty of the treasure really started to shine. Even with the yucky black spots on the same cloth it was really shining. Applying some fresh brasso to clean sections of the cloth I polished until I thought it couldn’t get any prettier. 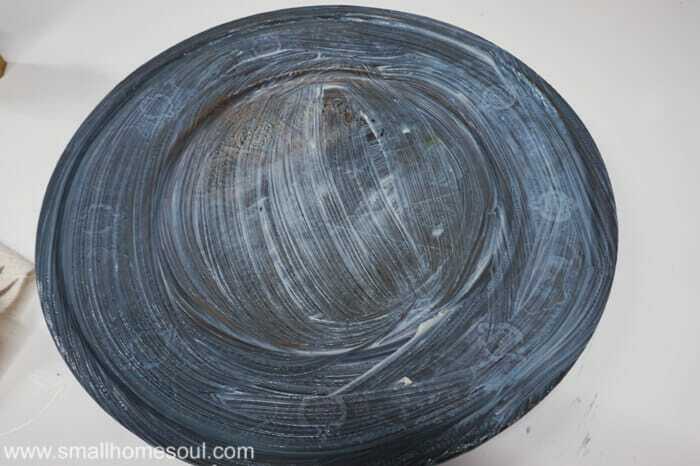 I finished up the polished brass with a clean cloth to buff and polish the platter until it was ready for its new home. I just started experimenting with mixed metals and gain more confidence in how it looks all the time. 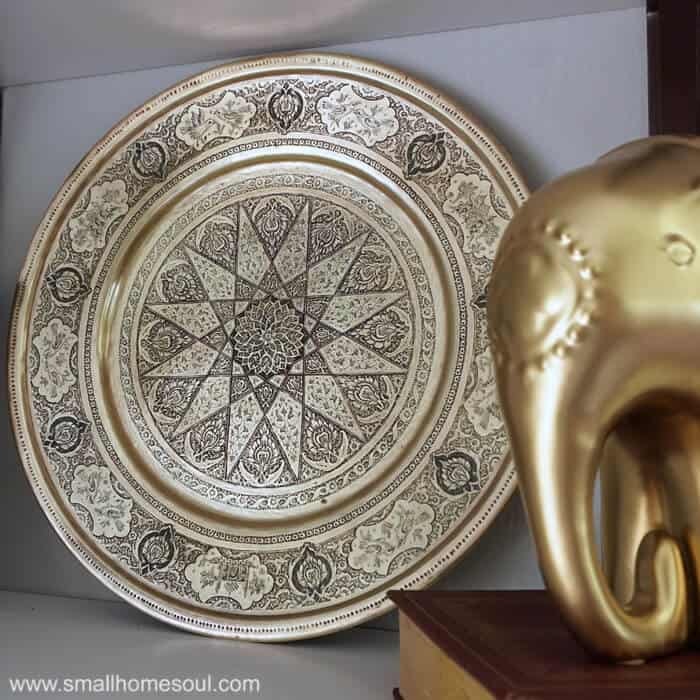 While the Living Room Shelves may not be the permanent home this intricate polished brass platter looks good next to the simple gold elephant. In this close up so you can see all the beautiful details. I love the little birds and temples that circle the platter. As best as I can tell this was made in India. There are no markings on the back so it’s hard to know for sure. Don’t forget to Pin it, and for more Decor Inspiration follow my Decor Board on Pinterest. Want DIY Inspiration delivered to your Inbox? and occasional internet deals I think you'll love. So I made the hard decision to turn off comments on my posts after a few weeks. If you have a question that isn’t answered in the post above please reach out via Instagram or Facebook page and leave a comment or send me a message. Thanks for visiting! Toni, I love playing around with mixed metals. This brass piece is a true gem! Great job! Toni!!!!! Aren’t you glad you didn’t donate this? It looks amazing. I totally forgot about Brasso. I have a lamp my mom found for $3 and maybe with a little Brasso we can restore it. I am so glad I gave it a chance. It’s beautiful. 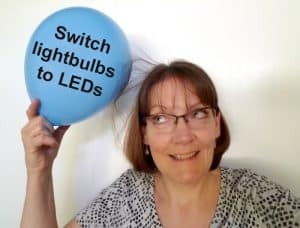 I bet it will make your mom’s lamp beautiful! 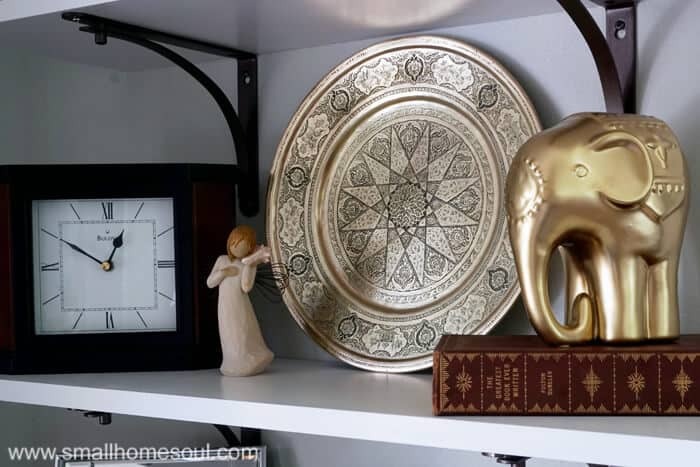 I love your brass platter and also how you styled your shelves with the brass piece and other items. It looks great. 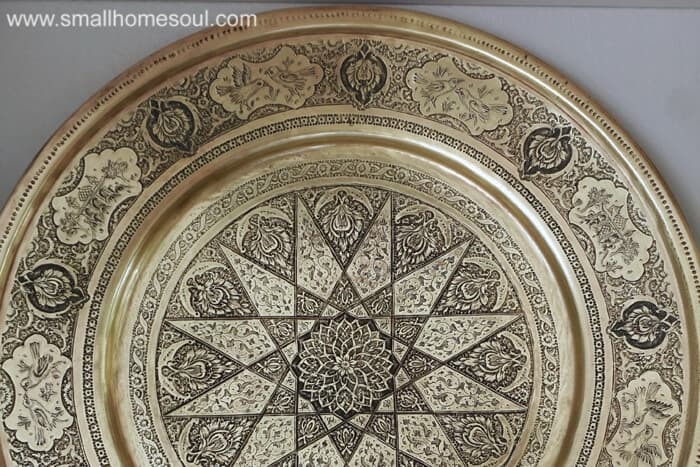 I think the shiny gold tone against your white walls and other darker-colored pieces really pops. 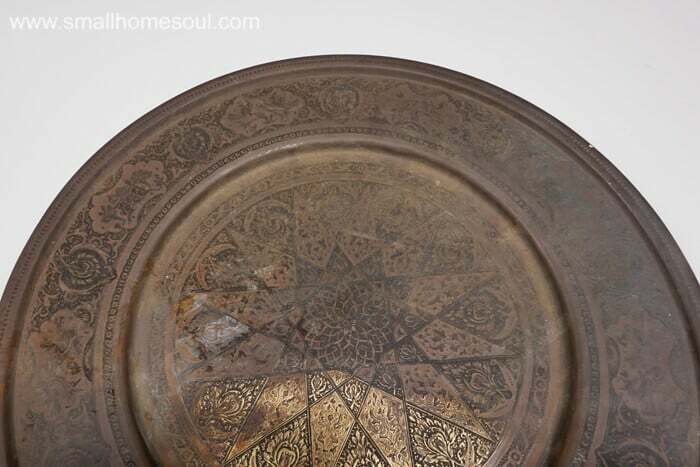 I recently published a post about cleaning and displaying brass items in home décor. 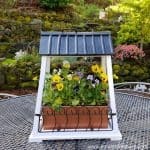 You might enjoy it: http://www.homewithmimi.com Thanks! What a transformation. I love it on your shelf with all of your collection too. Thanks Deise, I’m still learning about putting some things together. It’s an art for certain. Wow Toni! This looks brand new! Love all of the detail! I sure won’t be passing them by when I see them in the thrift store! 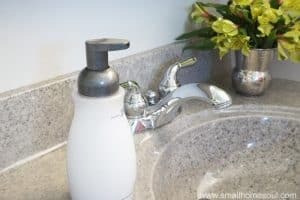 What a great trash to treasure project! It looks so pretty and I love how you decided to display it! 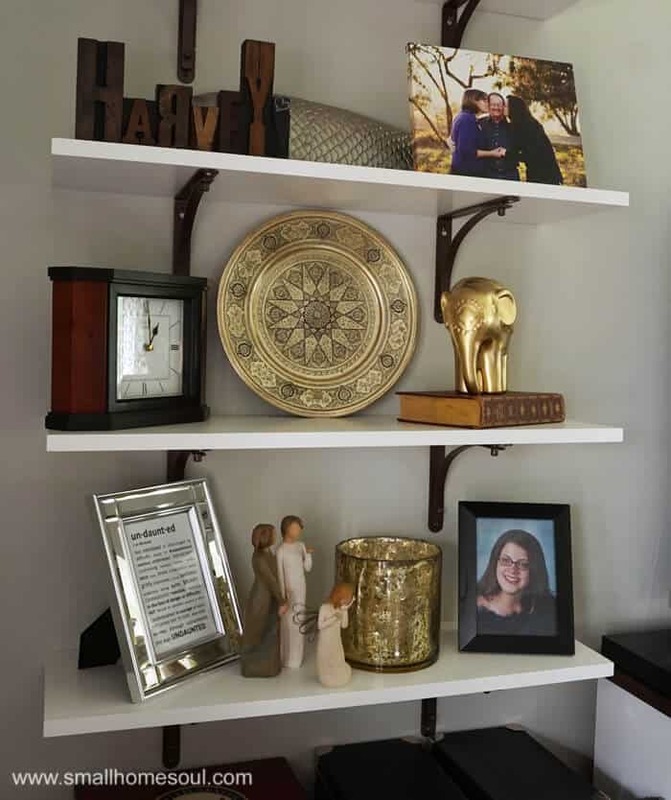 You placed it in such a beautiful vignette on your shelves! Thanks you Kellie, I take that as huge praise coming from you. You have the most beautiful vignettes.